Correspondent of Sovsport.ru, K. Zangalis, carried a long interview with Vladimir Kramnik, in which former World Champion speaks about the birth of his daughter and consequent tournament break, his first chess steps, career development and matches with Kasparov, Topalov and Anand. We bring you excerpts about the matches with Topalov and Anand, for the full interview visit sovsport.ru (Russian language), cited by e3e5.com. Zangalis: Who started that fight in Elista during the world championship match between you and Veselin Topalov? Kramnik: I knew that Topalov and his manager Danailov would be ready to do anything for fame and money. They have had already arranged the next match for the championship with even bigger prize fund. All that was left was to beat Kramnik. But when it became clear that the match is developing badly, they moved to a prearranged attack. The accusation started, that I often go to the toilet and receive assistance. They wanted to deprive me of personal toilet, private room. That I could not accept. Kramnik: I knew from the beginning that they had strong state support. But to bring special agents – it was too much. If you do that, it is unlikely that you plan to simply play chess. Because I have no doubt that the incident was prepared before the match. And the fact that they were able to appoint their friend Zurab Azmaiparashvili in the Appeals Committee, which considered the issues (and eventually decided all in favor of my opponent), only confirms this version. Zangalis: And why you, the Russian Grandmaster, playing at home, did not have protection of the authorities? Kramnik: I think that FIDE President Kirsan Ilyumzhinov simply could not take sides, because with his status he had to remain neutral. Topalov and his manager took this as a sign of weakness. And finally crossed all the limits. What would we talk about now, had I lost the tie-break in the end, one which might not even necessarily take place, had not Topalov stolen my point in the fifth game? I am not rancorous, but such things are unacceptable. I interrupted relationship with Topalov. Many well-known grandmasters followed my example. I do not greet nor talk to him, and so will be until he offers a public apology. 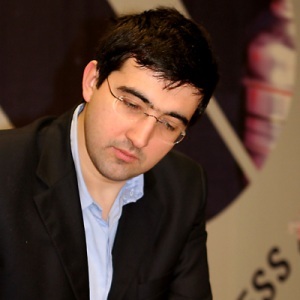 Kramnik: It is always possible to find a thousand excuses for the defeat. But it is your problem. Poor preparation, bad meal before the crucial game … That’s all excuses. There is the result. The rest are the circumstances that are resulting with win or loss. Anand’s victory was deserved. Zangalis: Looking back, what would you change during the match? Kramnik: Perhaps I would have chosen a different way to build my preparation. Zangalis: A new campaign for the world crown is possible? Kramnik: Anand is nearly 40-years old and he plays brilliantly. I am far from 40. There is time. And what is no less important, there is desire. My favorite phrase is – “man is responsible for the quality of the work, not for the final result”. I will work with dedication, as always. And then – whatever happens. At the present there are several pretenders for the title. I am still among them.